Hoverdia's First-of-its-kind Two-in-one 8x8 boxes as well as 9x9 boxes logic-number puzzles are partially filled up with some pre-set numbers. The aim is to fill up each block with a set of designated numbers exclusively. No repeating number on each horizontal and vertical block. The entire puzzle is alternatively represented either by 4 quadrants of 4x4 boxes or by 9 regions of 3x3 boxes. Each block, either with 4 boxes in each quadrant or with 3 boxes in each region, must be horizontally and vertically added up to a designated total sum accordingly. These styles of puzzles are very easy and fun as there are full of alternatives in decoding it, and moreover it is not a rigid puzzle game which would be usually aborted halfway through. Always start with RULE TWO as it is one of the two rules, which is indirectly known as alternative, for decoding these styles of puzzles in each quadrant (4x4 boxes) or each region (3x3 boxes). Each quadrant (4x4 boxes) or each region (3x3 boxes) can be easily cleared off by applying RULE TWO respectively even with only two or three known numbers. "There's always an opportunity, if there is an alternative"
Tutorial for the newly created Super Series. Hoverdia Eighteen is already in interactive puzzle game for both Pocket PC/PDA and Pocket PC Phone Edition running on handsets installed with Windows Mobile 2003, 5, 6 or 6.5. SmartPhone and Desktop PC platforms will be available soon. All the 1000 non-identical puzzles have three levels of difficulty. Re-select the same game number for timing improvement of a particular puzzle. Hoverdia Eighteen is published through BookSurge.com / CreateSpace.com with ISBN 9781419668159. This special edition (296 pages) contains 200 non-identical puzzles and is printed on pure white and high quality paper with a particular chapter dedicated to " how to decode the entire puzzle". Hoverdia Eighteen is also made available in interactive puzzle game for Desktop PC platform. This highly addictive number puzzle offers endless fun not only for the puzzle enthusiast but also for the whole family members as this puzzle game is non-violence. 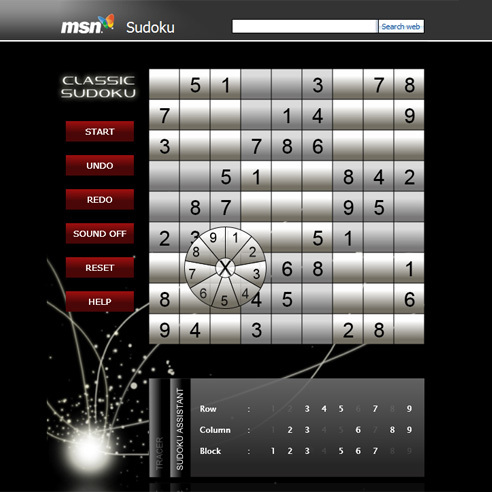 This downloadable trial version is limited to 5 puzzle games for Desktop PC platform only. For Desktop PC Trial version. Hoverdia Eighteen: First-of-its-kind Two-in-one 8x8 logic-number puzzle is partially filled up with some pre-set numbers. The aim is to fill up each block with a set of numbers from 1 to 8 exclusively. The entire puzzle is alternatively represented by 4 quadrants of 4x4 boxes. Each block with 4 boxes in each quadrant must be added up to an exact sum of 18 Horizontally, Vertically and Diagonally. This is a miniture version of the Hoverdia Eighteen. It is represented by 4x4 block which is called Mini Puzzle. The entire mini puzzle,which made up to 16 boxes in total, is to be filled up with only two set of numbers from 1 to 8 inclusively. Each block with 4 boxes must be added up to the sum of 18 Horizontally, Vertically and Diagonally. This puzzle is basically for kids with the brain training technique in mind. A variant of the Hoverdia Juvenile. There are 4 mini puzzles. Each mini puzzle is made up of 4x4 block. The entire mini puzzle can only contain two sets of numbers ranging from 1 to 8 inclusively. Each block must be added up to the sum of 18 Horizontally, Vertically and Diagonally. In addition to this, there should not be any repeating numbers against the opposite horizontal block and similarly against the opposite vertical block. A variant of the Hoverdia PlusSign. Being the same as Hoverdia PlusSign, the only additional requirement for Hoverdia HashSign is that the diagonal block with 4 boxes should not be filled with any repeating number against the opposite diagonal block. River Walk Multimedia Sdn Bhd, a game development company with Multimedia Super Corridor (MSC) Status, announced a strategic partnership with Conceptis Japan Co., Ltd. to provide various picture-logic and number-logic puzzles online in Southeast Asia. Online puzzle games will be powered by the CF-code81 game engine developed by River Walk Multimedia and running on the new Microsoft Silverlight interactive media platform. “We trust with both Conceptis' world acclaimed content and River Walk’s expertise, will thus redefine the landscape of puzzle game in Southeast Asia,” said Chie Fujisaki, Managing Director of Conceptis Japan Co., Ltd.
Conceptis has a huge database of logic puzzles for printed, electronic and other gaming media all over the world. Conceptis puzzles inclusive of Sudoku, Kakuro, Battleship, Hitori, Slitherlink, Hashi, Link-a-Pix, Maze-a-Pix, Fill-a-Pix, Dot-a-Pix, Pic-a-Pix, CalcuDoku and many more to come. Conceptis has become the major motivating spirit, spreading awareness of logic puzzles for the benefit of puzzle fan throughout the world. On average, ten million Conceptis puzzles are printed in newpapers, magazines and books each day. An electronic puzzle games for Pic-a-Pix and Maze-a-Pix are available in Nintendo DS platform by Software, Japan, Success Corp., Japan and G Mode, Japan. Millions more are played online and on mobile phones each month. Conceptis is a leading puzzle content provider and has been supplying its variety of creative logic puzzles to many puzzle magazine publishers through out the world. Conceptis's Kids Logic consists mostly of new puzzle inventions never seen before as well as some popular puzzle concept improved by Conceptis. The first release includes five puzzle familes: Paint-by-Blocks, paint-by-symmetry, Paint-by-Dots, and the kids version of Maze-a-Pix and Dot-a-Pix. More Kids Logic families such as Paint-by-Arrows, Paint-by-Areas and Paint-by-Symbols will be released soon. Conceptis's Kids Logic consists of different fun to solve puzzles and activities which at the same time develop cognitive skills, logic deduction, concentration and eye-to-hand coordination.